Proven antivirus & internet security software uniquely engineered to deliver exceptionally fast and effective security solutions to the home user. Choose from ESET’s selection of security software to make your computers vulnerability a story of the past. ESET business products provide unparalleled protection without increasing IT management overhead or slowing systems down. Deployment, configuration and management across a range of platforms is simple irrespective of company size. Recommended for your business, fast and light endpoint security. Using ESET Endpoint Antivirus will ensure a small footprint and minimal usage of system resource for your workstations. 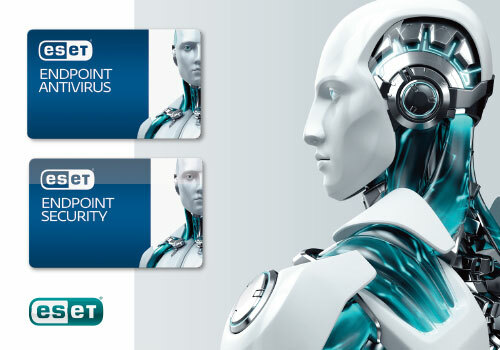 ESET Endpoint Internet Security combines the power and protection of the award-winning Endpoint Antivirus with additional benefits and capabilities. It is ideal for laptops and notebooks as well as providing added protection for your endpoints. ESET Mail Security for Microsoft Exchange Server eliminates all types of email-borne threats and unsolicited email, with harmful content filtered away at the server level – before it can do any damage. ESET’s solution for Kerio Connect filters all threats before they can enter your network, ensuring that every inbox across your company is protected. File Server Security, based on our high performance ESET Endpoint Antivirus. If you require stability, fast and effective detection, ESET File Security for Windows is the ideal solution for protecting your business data.